CLICK BELOW FOR A PRINTABLE FLYER! The Mount Horeb Area Historical Society (MHAHS) invites all to the June 3, 2017 Grand Opening of Wisconsin’s newest cultural destination, the Driftless Historium. Located in the heart of downtown Mount Horeb at 100 S 2nd St, the $1.7 million, three-building history center is the culmination of nearly a decade of community-based effort—from first visions, to drawings and re-drawings, to fundraising campaigns and the nitty-gritty details of construction. The Driftless Historium will celebrate its debut with a multi-faceted, family-friendly, daylong open house, featuring a “Musical Time Warp” outdoor concert event. This three-part performance, made possible by a generous grant from the Mount Horeb Community Foundation, traverses the history of modern music—from the charged songs of the Civil War, to the irresistibly danceable age of swing, ending with the energetic and irrepressible anthems of the 1960s. It all begins at 9:00 a.m. with a ribbon-cutting and opening remarks by Wisconsin Historical Society Director Dr. Ellsworth Brown, followed by the official unveiling of “Driftless Sanctuary,” a six foot tall, mixed metal hanging sculpture. Commissioned from John Pahlas of Mount Horeb’s Center Ground Studios, this one-of-a-kind stunning piece was designed to artistically convey the Historium’s foundational theme of the deep and enduring connection between the unique driftless landscape and those who have made their home here. Following this official opening, MHAHS staff and volunteers will welcome visitors inside the still-evolving structure. These folks will be among the first-ever to peruse the facility, and they will be permitted to check out not only the public spaces and newly stocked gift shop, but also those behind-the-scenes areas normally reserved for staff and trained volunteers. Hosts stationed in each room of the facility will explain the specialized functions of and future plans for each space, including the two exhibit galleries, multipurpose education room with kitchenette, environmentally sound artifact and archival storage, research and reading room and collections work room. Then at 10:00 a.m. the first of three musical acts take to the adjacent Front Street stage. America’s oldest Civil War brass band, the 1st Brigade Band, is the first stop on the day’s journey through music history. The all-volunteer ensemble is an homage to the Brodhead Brass Band, which enlisted in the Union Army in 1864 and served under the famous Gen. William T. Sherman. The 1st Brigade Band makes this intriguing history come alive by presenting period brass music, performed on antique instruments, while attired in 1860s era uniforms and gowns. Then, at 4:00 p.m., Beatles tribute band Walker, Kluseman and Steil, a staple of the Platteville and Dubuque music scene with decades of collective experience, will serenade us to the end of our musical journey. The foursome will regale the audience with a sampling of covers from The Fab Four, those giants of the early days of rock and roll whose influence is still pervasive today. 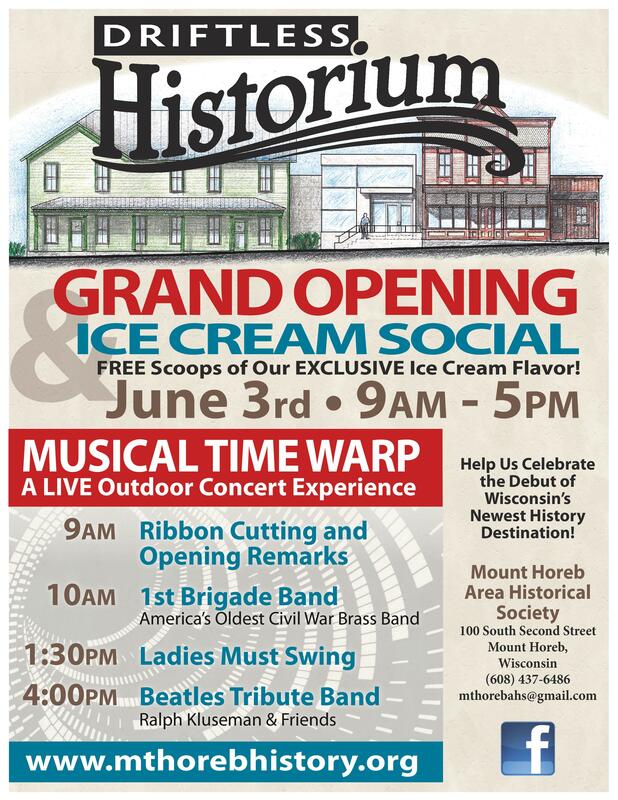 If a new museum, soaring sculpture and an outdoor concert series just are not enough to draw you to the June 3rd event, the Mount Horeb Area Historical Society will also be debuting the Historum’s exclusive “Troll Tracks” ice cream (a s’mores inspired blend, supplied by UW-Platteville’s Pioneer Farm), with free scoops from 10:00 a.m. to 4:00 p.m. while supplies last. Please plan to attend and help the Mount Horeb Area Historical Society honor the accomplishments of the past and celebrate a bright future. Can’t make it? Starting Sunday, June 4, 2017, the Driftless Historium’s regular public hours will be Wednesday to Sunday, 10:00 a.m. to 4:00 p.m., with a variety of special programs regularly offered. To learn more, call 608-437-6486, visit mthorebhistory.org or driftlesshistorium.org, or email.